The common name “shadbush” was coined because the species’ flowering often coincides with the time of the upriver migration of the shad fish. 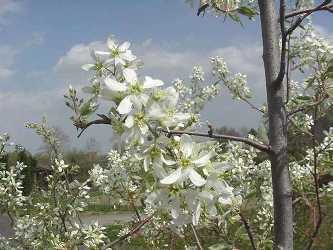 This species is also called the common serviceberry, a name derived from the Sarvis tree. It is hot! It is sticky! It is blue crab season. An artistic collaboration between ArtsWestchester and R.A.R.E, "Fish Tales" is an exhibition that marries art and science to raise awareness about lower New York's vital ecological systems.